MINNEAPOLIS/ST. 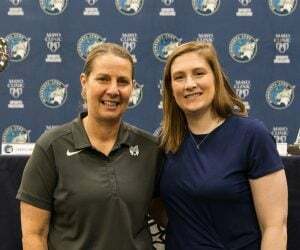 PAUL– The Minnesota Lynx announced the team has re-signed free agent forward Erlana Larkins and sign forward Kelsey Griffin to the team’s training camp roster. Per team policy, terms of the deals were not disclosed. Larkins, a nine-year veteran, was a WNBA champion with Indiana in 2012 and made the Finals in 2015 with the Fever. She originally signed with Minnesota on July 12 and finished the season with averages of 2.1 ppg on 44.4% shooting and 2.7 rpg in 13 games. 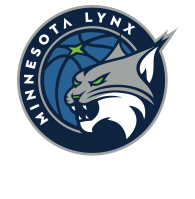 In her best game of 2018, the West Palm Beach native finished with four points, six rebounds and a career-high eight assists in the Lynx 89-65 win over the Fever on July 18. She added a season-high eight rebounds the following game against the Phoenix Mercury. In her best season as a pro, the 6-1 Larkins averaged a career-best 9.7 ppg on 59.9% shooting and a career-high 9.7 rpg in 2014 with the Fever. She led the league with a 59.9 percent clip as well as ranking third in the WNBA with 1.94 steals per game and was fourth in rebounding. Larkins’ 14 double-figure rebounding games were the most in a single-season in Indiana history. 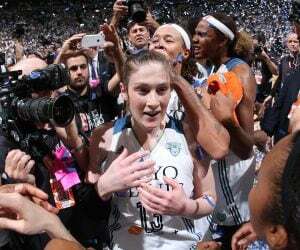 Her 303 total rebounds were also a Fever franchise record. In 247 career games (122 starts) with Minnesota, Indiana and New York, the former North Carolina Tar Heel holds career averages of 5.9 points (on 55.4% shooting), 5.4 rebounds and 1.5 assists in 20.7 minutes per game. 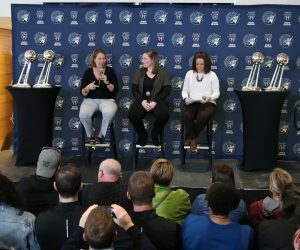 Griffin comes to the Lynx after wrapping up her best overseas season to date playing for Canberra, winning both the MVP of the WNBL (Australia) regular season and Finals. The Eagle River, Alaska native who is now a permanent citizen of Australia, played in 26 games this season and averaged a league-best 19.7 points on 50.6% shooting, a league-high 12.3 rebounds and 2.8 assists per game. She also ranked fifth in the WNBL in steals (1.69 spg) and eighth in blocks (0.96 bpg). 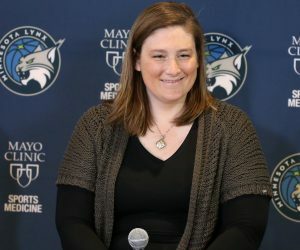 Drafted by the Lynx in the first round (3rd overall) of the 2010 WNBA Draft, Griffin was traded to Connecticut on draft night for the Sun’s first and second round picks in 2011. In 164 career games from 2010-2014 with Connecticut, she holds averages 4.9 ppg (on 37.6% shooting), 4.2 rpg and 0.9 spg in 18.0 mpg. Griffin appeared in three playoff games for Connecticut between the 2011 and 2012 seasons. Prior to the WNBA, Griffin played collegiately at the University of Nebraska where she held career averages of 16.0 points and 8.0 rebounds per game, while shooting 55.8% from the floor. Her senior year, Griffin was named Big 12 Player of the Year and earned first-team All-America honors from the WBCA, Associated Press, U.S. Basketball Writers Association and the Wooden Award while leading Nebraska to its first NCAA Sweet 16 appearance and Big 12 regular-season title in school history.